The bearish sentiment from last week towards the euro vs dollar has continued in today’s trading session with the pair pushing lower once again and now testing a potential key level of support at the 200 day moving average which currently sits at USD1.3126. 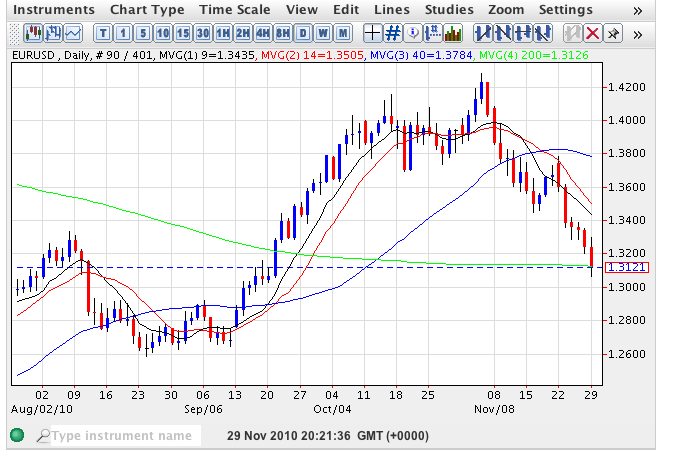 Indeed at time of writing the pair is trading at USD1.3119, hovering at this longer term moving average. Should we see a break and hold below this indicator then we can expect to see the pair continue their recent short term downwards trend towards an initial test of support in the USD1.2888 area, followed by a potential test at the USD1.2587 level, but only if we see a break and hold below the 200 day moving average. With the risk of contagion in the eurozone still a major factor we could yet see the euro plunge further and in these end of year, thin markets, with many traders squaring positions, trading will be both volatile and unpredictable. The key event in last week’s trading session was Tuesday’s wide spread down candle which breached potential support in the US1.3450 area but also broke below the 9 day moving average, propelling the lower as a result. In addition last Monday’s failure to breach the 14 day moving average to the upside also gave us a strong warning signal that the bounce to USD1.40 was unlikely to be achieved. The main items of fundamental news for the eurozone this week are likely to be German retail sales on Wednesday which are forecast to show an improvement to 1.3% from last month’s -1.7% and on Thursday the ECB meets once again to set interest rates which are likely to remain on hold at 1%, but as always it will be the press conference that follows the announcement that will no doubt take centre stage, particularly if references are made to the ongoing bail out saga. For the dollar the highlight comes, of course, on Friday with non farm payroll which is preceded on Wednesday by the ADP figures which are forecast to be positive at 70k, an improvement on last month’s 43k, whilst Thursday has the unemployment claims and pending home sales which are expected to remain poor.